Whether you’re looking to stage a seafront wedding in one Britain’s coastal towns, or are packing up to wed before a stunning horizon overseas, there are a number of practical considerations to make when it comes to choosing your perfect beach wedding dress. Our seven handy hints will make sure that you not only settle on a piece that makes you look and feel beautiful but also compliments your big day by the sea. 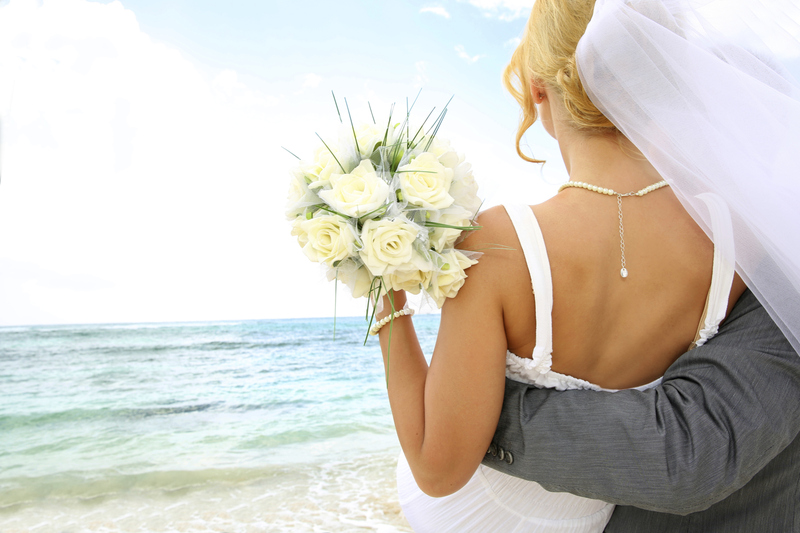 A beach wedding often means a destination wedding which means your dress will have to travel. Locating a dress that is suitable for packing and carrying onto a plane as hand luggage will save you a lot of bother and worry while reducing the likelihood of it being lost or damaged. Sure, the idea of your bridal train flowing along the sand may strike you as romantic, but in reality it really won’t be. Getting your dress full of sand could easily tear or damage the fabric and make it seem dirty to your guests and when photographed. Shorter hemlines are a great choice for beach weddings with cocktail length and tea length dresses looking particularly good. Other brides may choose a varied length skirt – calf length at the back and knee length at the front – creating a more bridal appearance without it trailing in the sand. Weddings held at exotic beach locations, or even those by the British seaside, tend to appear and feel less formal than indoor weddings, so a very structured formal bridal gown could look out of place. The ideal dress for your big day by the sea will be made from a lightweight fabric and will caress the lines of your body giving a soft and smooth silhouette, and could be complimented by loose curls and a fresh bouquet. While strapless gowns are forever in vogue, they often involve a lot of material and internal support, all of which can be hot and irritating on a hot day at the beach. If you’re searching for a slinky style, nothing’s better than white spaghetti straps against suntanned shoulders, and straps also allow for a dress with a low cut back. Many brides rely on high heels to make their dress look and feel perfect as heels can totally change the overall effect of a dress. However, a beach wedding dress needs to look good with either flat shoes, pumps, flip flops or bare feet, as high heels and sand aren’t the greatest bedfellows. For those of you holding a seafront wedding or taking your vows on a beach abroad, you will be hoping for hot weather with plenty of sunshine. With this in mind, ensure the fabric of your gown won’t make you overheat or sweat. Light breathable fabrics that are appropriate for beach wedding dresses are chiffon and charmeuse so be on the lookout for dresses making use of these materials. Whether travelling abroad or organising a coastal wedding in the UK, there is always a possibility of a strong breeze. With this in mind, try to cut down on any loose accessories on your outfit that might blow around. Plenty of brides decide against a veil with their beach wedding dress, while mini skirted dresses are also best bypassed to reduce the risk of embarrassment.